A healthy Midnight Snack that tastes out of this world! 70% dark chocolate, roasted hazelnuts and a superfood: popped amaranth. Try it once and never have anything else ever again in your life at midnight! Here goes special credit to my man. He is Mexican and missed his beloved puffed Amaranth a lot so he went on a mission to find it in Montreal. Nowhere did he find it. Not even our Latin American Store where you tend to find almost all Latin American products. Luckily the health food store had raw amaranth and then all we had to figure out is how to puff amaranth. Which, by the way turns out to be ridiculously easy. Even easier than popping popcorn. Here is the full tutorial: How to Puff Amaranth. The midnight snack is inspired by the super popular Mexican “alegrías” which are some sort of candy sold in bar form. They are simply puffed amaranth with melted raw sugar and then left to set. 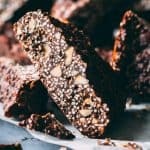 My husband wanted to prefect the recipe though and give it his own spin so he added his favorite treats to the puffed amaranth, nuts, dried fruit and…..chocolate! When I first tried his experiment I BEGGED him to let me post the recipe on the blog. It’s the first recipe he’s ever developed probably and it’s a keeper for live. Why call it midnight snack? Well, we rarely have dessert or sweets in general. However, right around midnight we often crave “naughty food”, hahaha. 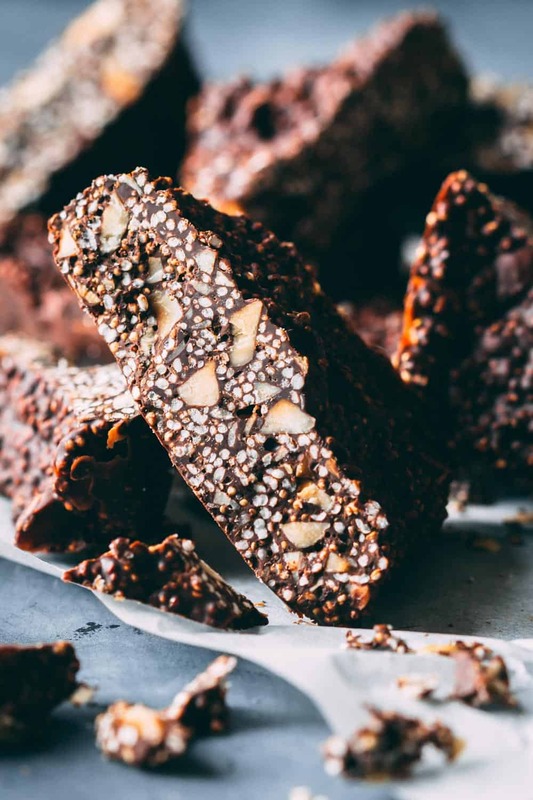 Most of the time we just get over it, go to bed and forget about it, but sometimes the craving is stronger than our will and having a healthy-ish alternative to plain chocolate is actually quite amazing. Melt chocolate and mix with popped amaranth and chopped roasted and peeled hazelnuts. Add to a parchment paper lined freezer-proof container and spread out evenly. Put in the freezer for approximately 15 minutes. Alternatively you can you white chocolate and add dried cranberries and chopped macadamia nuts as well <<-- SOOOO GOOD!!! This looks so good! Will have to try it. I LOVE this. I had all the ingredients to make except the amaranth, which I found online since I was ordering anyway (found a bag already popped)! I made a batch with dark chocolate, cashews and cranberries and loved it. Thanks for giving me a quick, delicious recipe that introduced me to a new ingredient! AMAZING Stacey! I’m so happy you liked it and lucky you for finding it popped already. That saved you a lot of cleaning up, haha. What dried fruit did your husband use? I don’t see any in the ingredients list and not sure what would go best. Thank. These look wonderful! How/where do you store after cutting up? How do you pop amaranth? Looks delicious !! What brand of chocolate do you like to use?